We used to learn from newspapers how cosmonauts live on the International Space Station (ISS). Now we can see for ourselves images of their daily lives via Instagram. 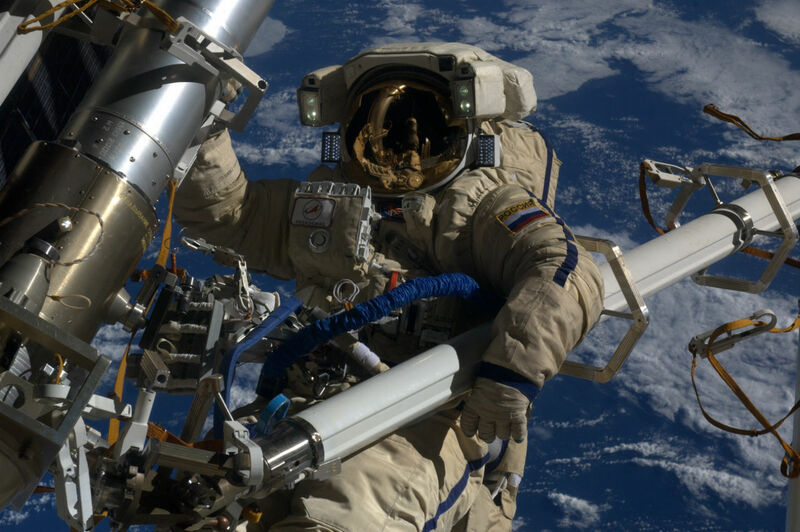 Cosmonauts are publishing incredible landscapes, interesting moments involving their work and life on the ISS and even selfies from outer space. Cosmonaut Sergey Ryazantsev's Instagram. The International Space Station at sunrise. As the Earth orbits ISS astronauts see 16 sunrises a day, since sunrises and sunsets alternate every hour and a half. The ISS team: Crews come from various countries, men and women. Everyone has different objectives and length of time onboard. Cosmonaut Anton Shkaplerov's Instagram. This is what individual hygiene kits look like. The cosmonauts do not take showers on the station. They wash themselves with sponges and wet wipes. Cosmonaut Oleg Novitskiy's Instagram. Eating on the station is always a joyful occasion. Salt and spices here are in liquid form to avoid the grains getting in astronauts' eyes, though food can be let loose in zero gravity. The photograph shows a dinner, which the whole team is trying to attend. Astronauts also love selfies. This one was taken on Cosmonauts Day (April 12) during a spacewalk. Cosmonaut Sergey Volkov's Instagram. Cosmonauts post many images of earth landscapes from space. This is a photograph of Africa, although it could easily be the surface of Mars. The KONTUR-2 experiment: Aboard the ISS, Sergey Volkov is operating a robot that is located in Munich. In the future these robots are expected to assist cosmonauts on the station, carrying out work in outer space and maybe on other planets. Cosmonaut Oleg Artemiev's Instagram. The Aurora Australis (Southern Lights) over the South Pole - just as awesome when seen from space as when observed from Earth. Oleg Artemiev enjoys sending his best wishes for various holidays to his Instagram followers. On August 26, 2016 he sent greetings to his colleagues on the 70th anniversary of the foundation of the Energia Rocket and Space Corporation. Earth seen through the ISS cupola. In the past, Soviet cosmonauts were taught to take photographs according to the principles used during the filming of 1969 movie, White Sun of the Desert. The tradition of watching this film before departing for space continues to this day. Every cosmonaut has family photos; they normally talk to loved ones at the weekend. Physical exercise for cosmonauts on the station is essential because living in zero gravity causes their muscles to atrophy. Before returning home, extra treadmill sessions are scheduled. Before returning to earth all safety features on the ISS are checked. On Earth we see sunrises, but in space you can watch the Milky Way ascend. Happy faces of an ISS crew preparing to return home. Russian cosmonaut Gennady Padalka holds the world record for the most time spent in orbit aboard the ISS - 878 days, 11 hours.